★SUITABLE FOR SMALL, MEDIUM AND LARGE CANS: The Boshel® Pet Food Cover has 3 separate slits to perfectly fit a variety of dog and cat food cans for total convenience. ★MAINTAIN FRESH, TIGHT SEAL ON PET FOOD: The convenient Boshel® Pet Food Can Cover keeps your pet\'s food perfectly fresh and avoids unpleasant smells in your fridge. ★NON-TOXIC, NO PHTHALATES AND BPA-FREE: Your pet\'s health is in excellent hands when you use a Boshel® Pet Food Cover; they\'re FDA-approved and do not contain any harmful chemicals which could leach into your dog or cat\'s food. 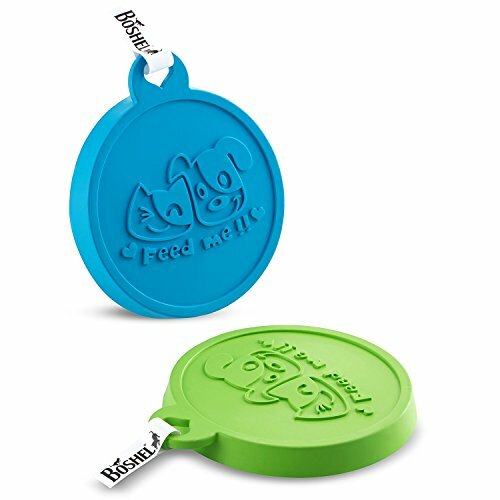 ★DISHWASHER SAFE: Constructed from durable silicone which withstands temperatures up to 450°F, the Boshel® Pet Food Lids will not crack, melt or warp even when cleaned in the dishwasher. ★CAN ALSO BE USED ON PEOPLE FOOD CANS: For even more flexibility, the Boshel Pet Food Can Covers are also suitable for use on cans of soup, veggies or any other canned produce.